The first residents of Indiana's Marshall County were believed to have been Native American mound builders. When General Tipton cleared the natives off the land in 1838, German Township was founded with the first settlement of Clayton. 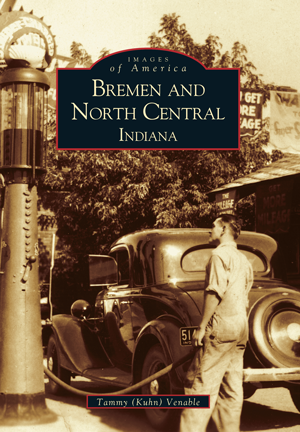 This photographic history of Bremen and the surrounding area is an early account of the lives of the residents who molded the region, from the first settlers of the 19th century, to the groundbreakers of today. Including images from St. Joseph, Marshall, and Elkhart Counties, Bremen and North Central Indiana is a testament to the spirit of America's early German settlers. Like most villages and towns in early 19th century America, Bremen consisted of the wares of everyday life: businesses, schools, religion, and families. Pictured here in over 200 vintage images are those earliest institutions, including the town's largest employer at the turn of the century, Wright's Wood Bending Factory, the area's first school building of 1835, views of unpaved downtown Bremen and its bustling inhabitants, and the origins of the annual "Fireman's Festival," which is still celebrated today. Utilizing town records, newspapers, oral histories of the area's residents, and personal photograph collections, author Tammy (Kuhn) Venable brings to life the extensive history of this portion of northern Indiana. She is a life-long resident of Bremen and amateur genealogist.